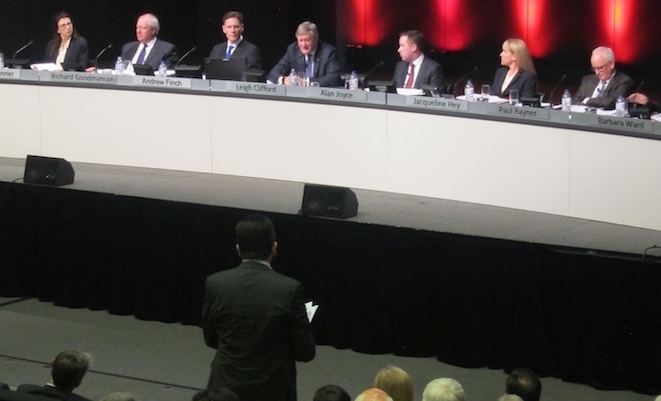 Independent Senator Nick Xenophon speaks at the Qantas AGM. Independent Senator Nick Xenophon headlined a list of frustrated shareholders looking for answers at Qantas’s annual general meeting in Melbourne on Friday. The Senator took the step of purchasing $500 worth of Qantas shares to attend Friday’s annual general meeting and quiz the board on “questions that mum and dad shareholders have asked me to ask”. Xenophon focused on the so-called real cost of Jetstar’s Asian operations, the nature of “confidential” briefings given to institutional investors and how Air New Zealand was able to post record profits while Qantas slumped to a $2.8 billion loss in 2013/14. On Jetstar, Xenophon asked chairman Leigh Clifford and chief executive Alan Joyce whether the low-cost airline group had “actually extracted one dollar of tangible, trade-related profit from any of the Asian investments in the last decade”. “I’m not talking about book profit,” Xenophon said at the AGM. “To what extent has Qantas brought one dollar home from Asia in a decade in terms of the Jetstar Asia franchises”. “Last year it lost money because its local competitor added a huge amount of capacity and pushed the market into losses,” Joyce said. Joyce and Jetstar Group chief executive Jayne Hrdlicka have both said previously Jetstar had delivered $1 billion in profits to the Qantas Group. However, Xenophon said he didn’t regard those claims as credible. “Under current Australian accounting laws you can be as clear as mud when it comes to transference of costs within divisions of an airline,” Xenophon told reporters prior to the AGM. Xenophon also queried the nature of what Qantas told a Senate committee were confidential briefings with institutional investors between October 18 – the date of last year’s AGM – and December 5 2013. The gathering at the Melbourne Exhibition and Convention Centre, which lasted about two hours and 20 minutes, also heard from a number of Qantas staff members keen to share their views about the current state of the company. Col Rayner, a member of the Transport Workers Union, who works as an airline service operator for Qantas at Sydney Airport, said morale among his work colleagues was “at an all-time low”. Meanwhile a Qantas 737 captain, Greg Harper, said record customer satisfaction levels the airline has been touting probably didn’t include Qantas international passengers in Perth and Adelaide, given Qantas had left them “high and dry”. Moreover, he said management “hadn’t been up to scratch”. “To say our customers, who we have surveyed, say we are doing well, they are the customers we have left,” Harper said. Elsewhere, a Qantas business class flyer and shareholder said the airline had been “gutted” under Joyce and Clifford’s leadership. And Australian Services Union assistant national secretary Linda White also urged Qantas to reconsider the loss of staff from the closure of call centres in Brisbane and Melbourne. 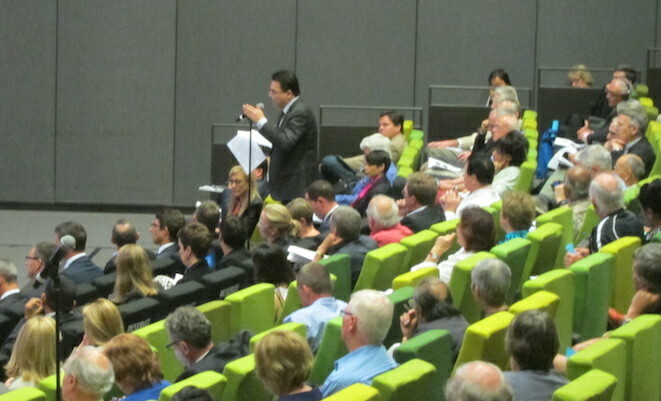 Senator Xenophon asks a question of the Qantas board. Did Nick pay for those Qantas shares outta his own pocket or did the taxpayers ? Well you’ve got to hand it to him. He’s one of a few prepared to get off his backside. Both State and Federal parliaments need more Nick Xenophon -. Politicians who put the people before the party. How Joyce and Clifford have held on to their jobs and HUGE pay packets in the light of the company’s performance is an indictment of the shareholders. Thank you Nick for taking some tough questions to Joyce. He has been the worst page in the flying Kangaroo’s history and still he can smile about it as he fills his pockets for a job my three year old could do better! @Peter R Out of his own pocket. Its illegal for an MP or Senator to use taxpayer funds for investment purposes. So let me get this straight. Joyce cuts thousands of jobs to cut costs, records record losses under his “leadership” but he stands to gain $2.5m in a few years time? And the shareholders approved this? No wonder this company is in shambles. Nick Xenophon is the only politician prepared to take Joyce and Hrdlicka on over these issues. The “Asian expansion” strategy for Jetstar has come at the expense of QF “International” and has cost thousands of jobs to be lost and massive amounts of money, with ‘cost shifting’ and ‘cost transference’ the only way to hide the blunders and bad management of Joyce, Hrdlicka and the Qantas Board. Who is @Peter R>? What kind of comment is that? Nick Xenophon is one of the rare politicians who gets down and dirty in understanding issues and one of the rare ones who is truly there to try and represent the ‘majority’ of Aussies not vested interests and big business. Mmmm here we go again…all the armchair experts who know more than the institutional investors who support Joyce and his board….really people get real! It is the institutional investors that know what they are doing when they invest their $100s of millions in Qantas not some half bake politician with his $500 worth. I am surprised one of you has not raise how great AirNZ is???? Lets have a little look back at history. AirNZ collapsed and the NZ Gov bailed them out. It gave them a chance to restructure removing all the costly legacy work practises. Qantas could have done the same thing, shut down International and started again but to their credit they did not. To those that keep saying sell off Frequent Flyer, sell off Jetstar, obviously you are not business people just armchair experts as anybody in business knows you do not sell off the divisions generating the cash flow. I had retired some years ago from QF after 32 good years. Never ever did I expect to see the “roo” on its side. No hop in it left. Few of my workmates, who still labor at QF are dismayed and lethargic about the management. There have been some dismal GM’s in QF in the past, but the Irishman takes the some extra praise for being a man without vision and ability. Even G. Dixon was better (but not much…) And my shares today are worth how much…? I agree with you PeterL, well said. My only comments on QF is that the Board recognises the most important assets to the business are the staff not the planes. Empower them to inspire, create and lead will pull the business ahead further than any new uniforms and technology ever will. Without your people on board, you can only expect a sluggish performance at best. Alan Joyce deserves some credit, he has had to make some really tough decisions left to him as the legacy failings of the previous boards. I do see a positive future ahead but the flying world as we know has changed so much in in the short history of aviation. It is a very dynamic environment. Sack Joyce and employ a board with vision to build on this great airline!! Yes Nick Xenophon deserves praise. He is one of the very few who will question the big side of town. In this case Qantas have a lot to answer for and it seems little was revealed from his queries at the AGM. The continual downslide Mr. Joyce has generated is absurd and it astonishes me few other aviation luminaries have not taken him on as Mr Xenophon has. Where is the vigor of debate, transparency and resolution? I don’t know enough about the details to comment decisively. I do suspect that Joyce and the Board have loaded Qantas International with more than its fair share of the debt. But what I can say decisively is that, like many Australians, I always had a good feeling towards Qantas and was always prepared to pay a little extra to give them my business. But somehow Joyce has destroyed that loyalty. I’ve joined other rewards schemes now and fly the best price on the day. Qantas is now just one of the many. In fact, I think I’m a bit partial to Virgin…….